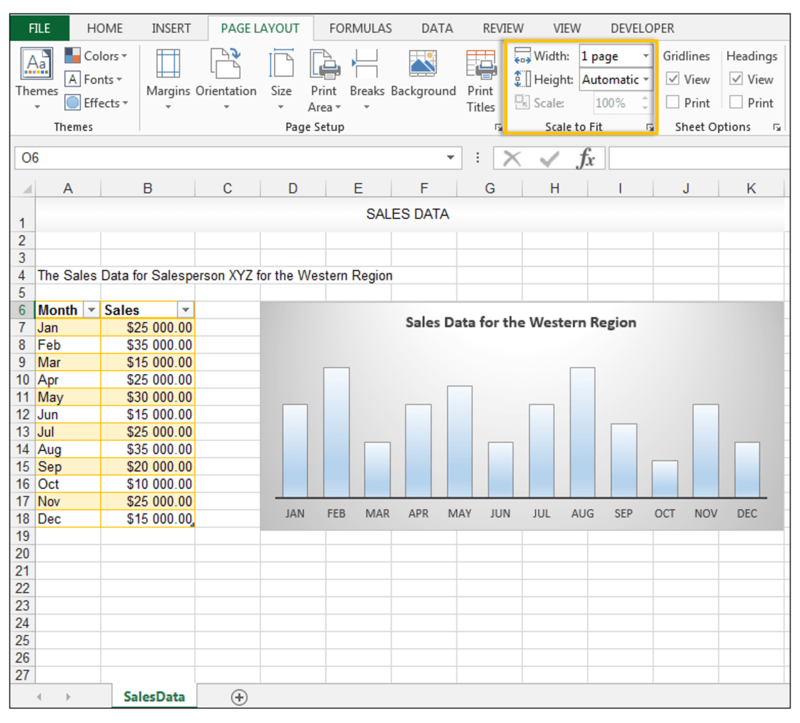 This is a question that is often asked (How to Print Excel Sheet on One Page), namely how to fit the contents of one’s spreadsheet on one page when printing. So we are going to look at three ways of achieving just that. 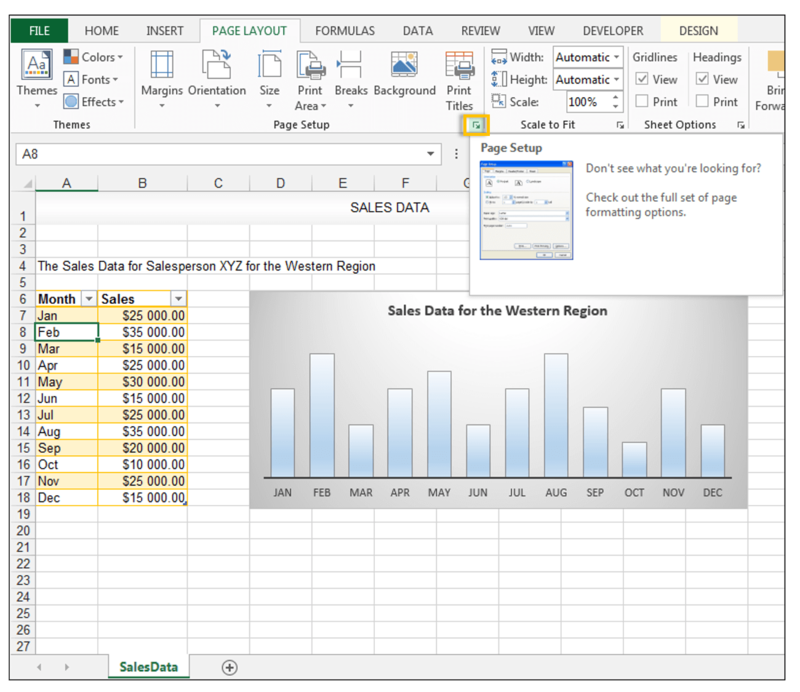 A hypothetical salesperson is looking at the sales data for the year 2016, for a certain region. 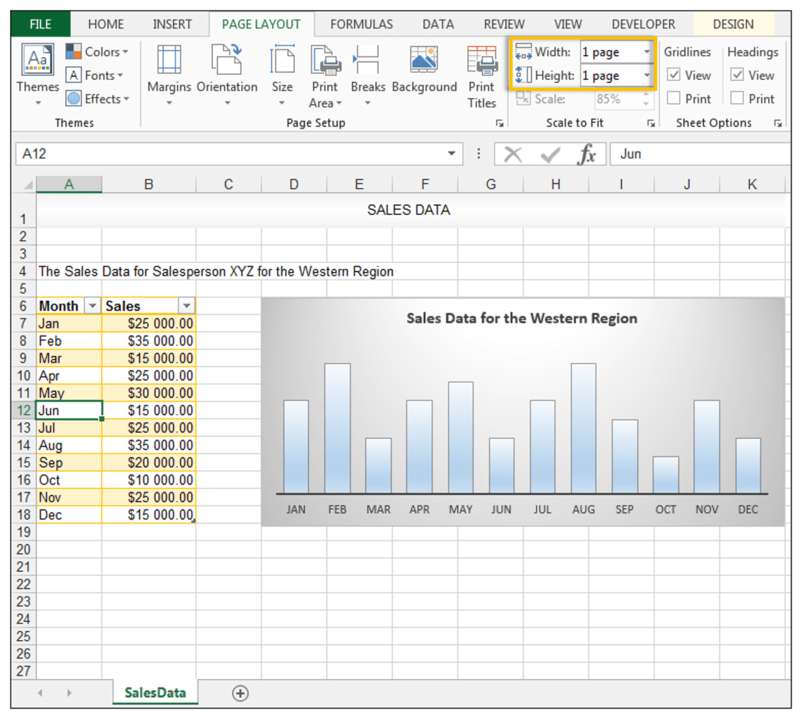 The spreadsheet contains text in cells, a chart, and an Excel Table as shown below. 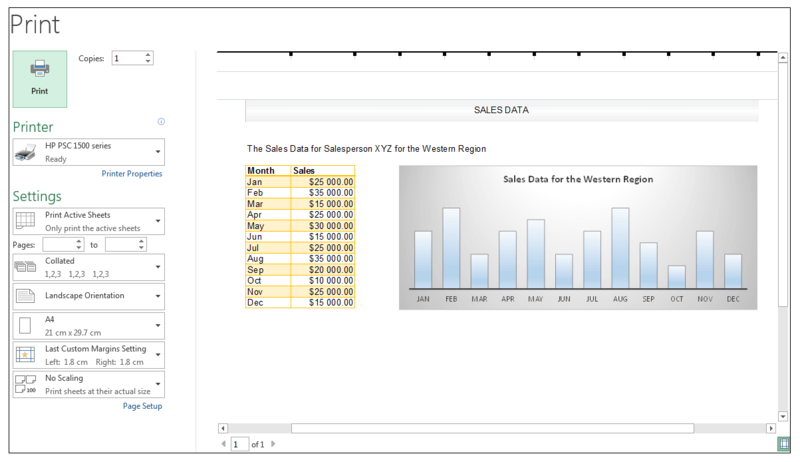 1) The salesperson ideally wants to print all the data in the current sheet (text, chart, and Table) on one page. So the first thing to do is look at the current Print Preview. 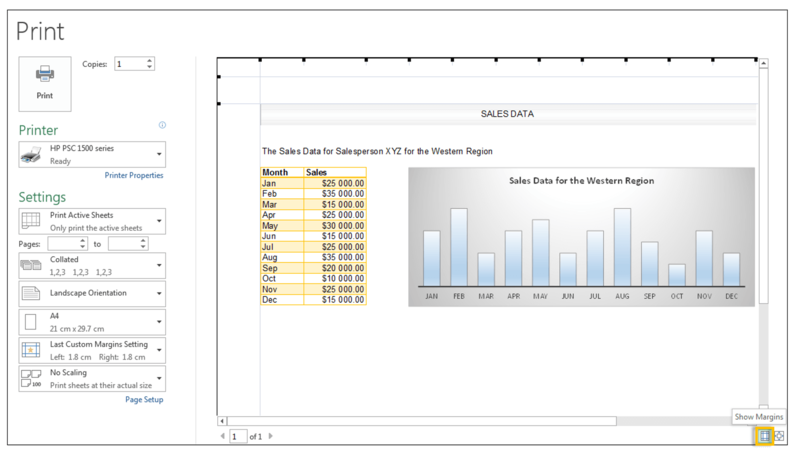 2) Go to File>Print in order to see what the worksheet with the above data, will look like if printed. 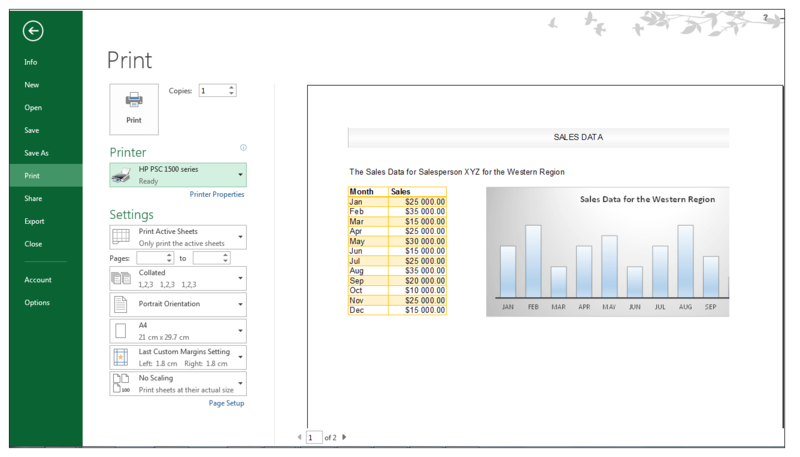 3) The data is printing across two pages as shown in the Print Preview with part of the chart spread across two pages, and ideally, we want the spreadsheet with all the data printed on one page. 1) One way of achieving this is by going to Page Layout>Scale to Fit and changing the width in this case, since all the columns are not being accommodated, from Automatic to 1 Page as shown below. 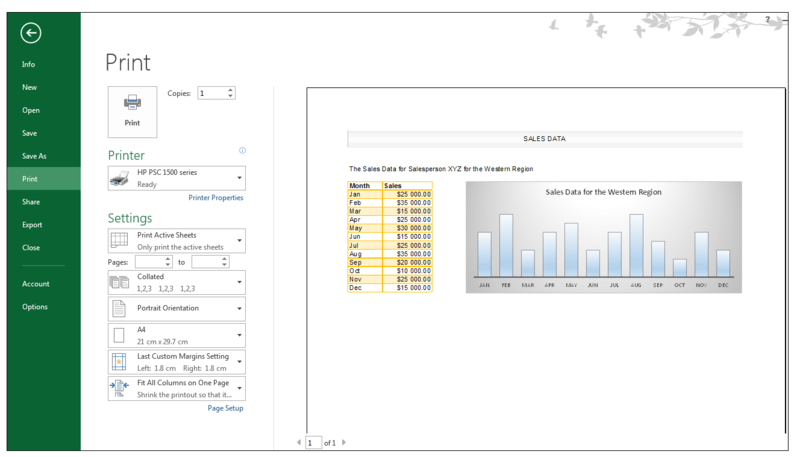 2) If we go to Print Preview now, by going to File>Print, we can now see that the spreadsheet will print on one page. 1) Another way of accomplishing the above without changing the Scale to Fit Options, is by changing the Page Orientation, to Landscape, again this is in the case of where the columns are not fitting on one page, the most common scenario. 2) In order to do this, go to Page Layout>Page Setup>Orientation and change the Orientation from Portrait to Landscape. 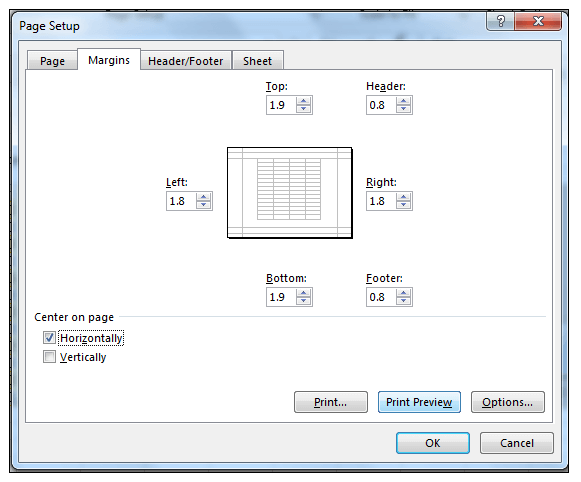 3) Going to Print Preview by going to File>Print, we can now see that the spreadsheet is printing on one page. 4) This solves the printing on the one-page issue, however, if one turns on margins, in the Print Preview, we can see that the data is not evenly printing across the page, it is taking up the left side mainly. 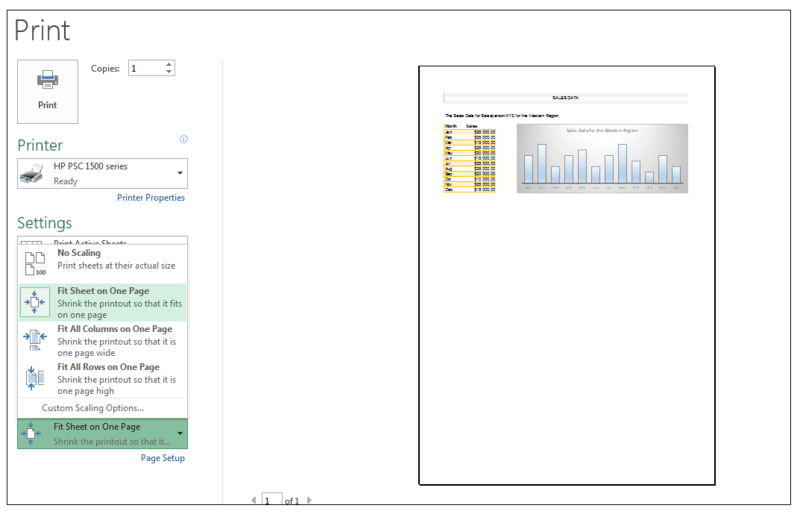 5) In order to distribute the data more evenly on the page, go to Page Layout and expand the Page Setup section, in order to launch the Page Setup Dialog Box. 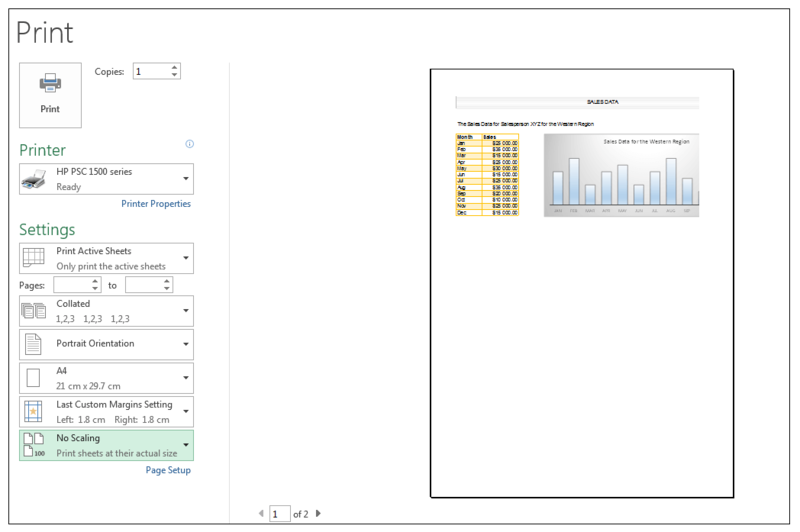 6) Select the Margins Tab and check the Center on Page Horizontally option as shown below. 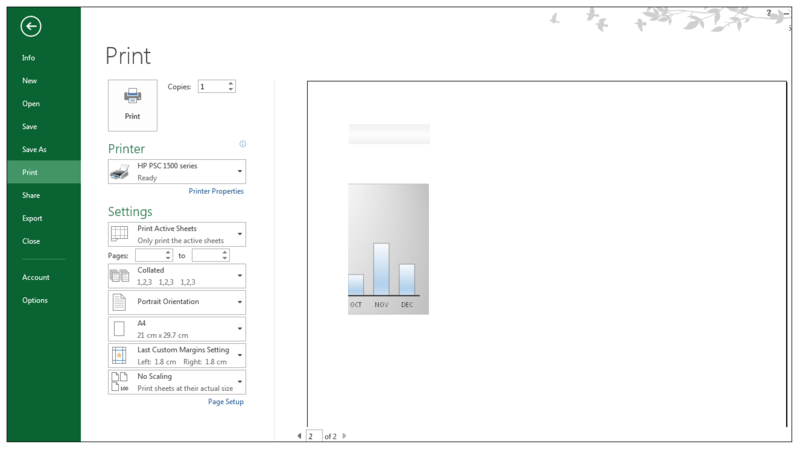 7) Selecting the Print Preview option shows that the data is more evenly distributed across the page. Generally, there are times when one may need to change both the width and the height to one page, however, this can make the data difficult to read since the scaling reduces the size of all the data to fit on one page. As mentioned above, one can use the Fit Sheet on One Page option. 1) Using our original source worksheet, we go to File>Print in order to see the Print Preview and the default setting is No Scaling as shown below. 2) One can change this by selecting Fit Sheet on One Page as shown below. 3) The effect of this can be seen on the scaling of the page, and the reduction of the number of pages needed for printing. Additionally, by going to Page Layout>Scale to Fit – one now sees both the width and the height options have been set to one page by choosing this option. However, as mentioned this scaling option should be utilized with caution and depending on the data in the worksheet since it can sometimes reduce the size of the data on the page to the point where readability and legibility become difficult. 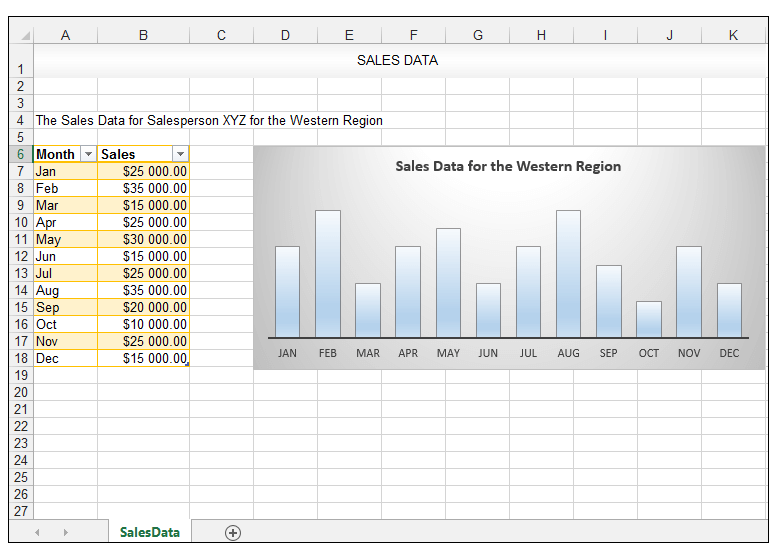 Printing an Excel spreadsheet on one page can be accomplished by either changing the width or the height. One can also adjust the Page Orientation and change it from the default Portrait to Landscape orientation. 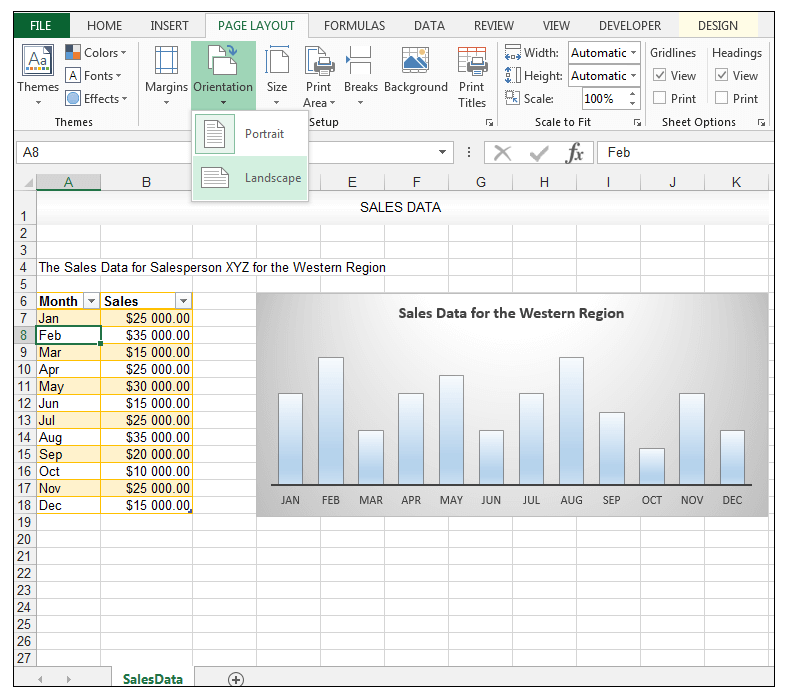 Please feel free to comment and tell us the printing options you frequently use in order to accommodate data in your spreadsheet.